You do not need the latest exercise machine or even a single piece of equipment to do a challenging workout that burns calories and helps you lose weight. To lose weight quickly, focus on intense cardiovascular exercises. As you get fit, you will need to modify your workout so that you continue to burn enough calories to lose weight. If you have medical concerns, schedule an appointment with your doctor before starting a fitness plan. The fastest weight-loss exercises are those that raise your heart rate and have you breaking a sweat. Depending upon your current weight, running 8 mph burns between 986 and 1,472 calories in one hour. Other top choices for burning the most calories include tae kwon do and skipping in place as if you were jumping rope. Some lower-impact workouts also burn about 700 to 800 calories per hour, including rollerblading and quickly climbing stairs. Warm up at a lower intensity or with warm-up movements before you raise the intensity to the above levels. Complement your cardiovascular workout with some muscle-building moves. While strength training does not burn calories as quickly as aerobic workouts, it replaces fat with lean muscle mass. You raise your resting metabolism, which means your body burns more calories to support the muscle mass. Resistance exercises that have you working against your own body require no equipment. Target your whole body with pushups. Build lower body muscle with squats, lateral raises and lunges. Strengthen your core with situps, planks, knee raises, or Pilates exercises. Work your upper body with pullups, chin-ups, and triceps dips. You can even mix these with you cardio training or do them separately at a fast pace. Build your flexibility and strength by doing yoga workouts. If you move through a series of sun salutations at a fluid pace, you raise your heart rate and make it a cardiovascular workout as well. Engage your core muscles so that you can do yoga poses using your full range of motion. Inhale deeply, filling your belly and your chest, and empty your lungs completely on the exhale. The back-to-basics style of many boot camp workouts means that you do not need equipment or machines to burn calories and lose weight. 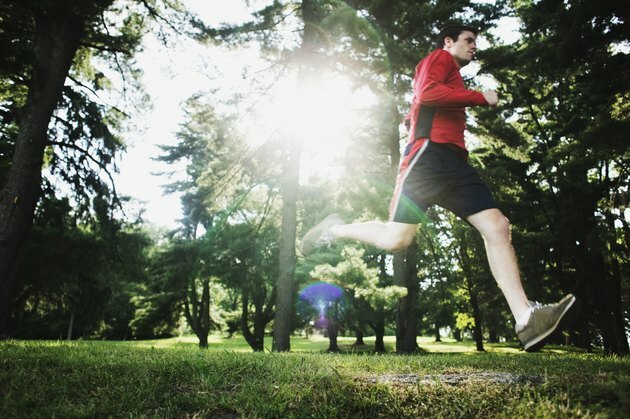 Create your own boot camp by focusing on cardiovascular challenges such as dashing around the park, sprinting up stadium steps or climbing steep hills. Add strengthening and flexibility work by doing burpees, military-style pushups, the plank pose and squat jumps. Calisthenics such as jumping jacks and abdominal crunches at an incline round out the workout.